As a grandmom, I like to have fun activities for the kids when they are visiting. Interactive games for varied ages work well. 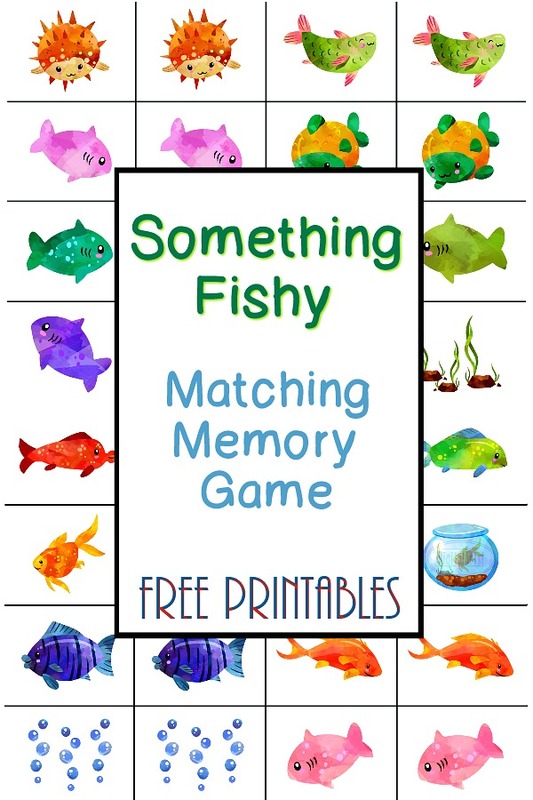 These cute and colorful, Something Fishy matching memory game, provides hours of fun for kids while building recall, focusing and problem solving skills. The object of the game is to collect the most pairs of tiles. There are 32 tiles; 16 matching pairs. Shuffle the tiles and lay in rows, face down. The youngest player goes first and then moves around in a clockwise direction. First player turns over any two tiles. If the two tiles match, keep them. If they don’t match, turn them back over (in the same position). Watch and remember during the other player’s turn. The game is over when all the tiles have been matched. For younger children, choose a smaller number of tiles to match. 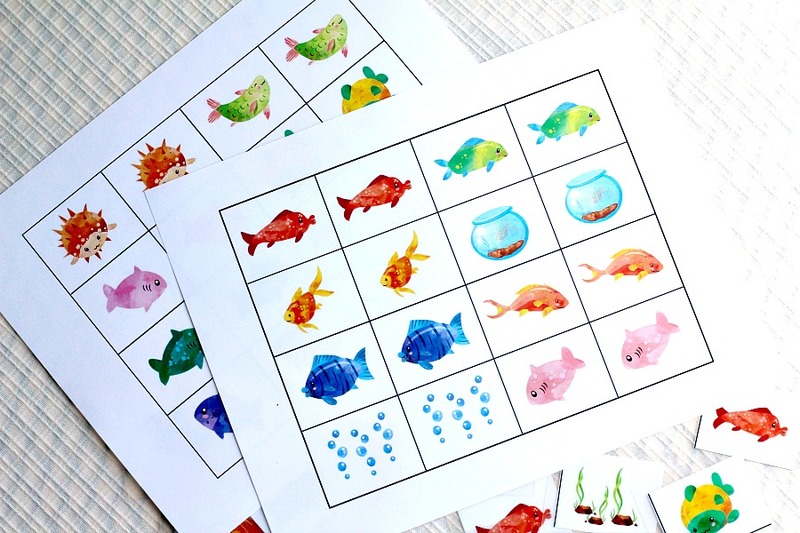 (Take out some of the more similar colored fish in this game) and increase the number of tiles as skill and confidence grows. 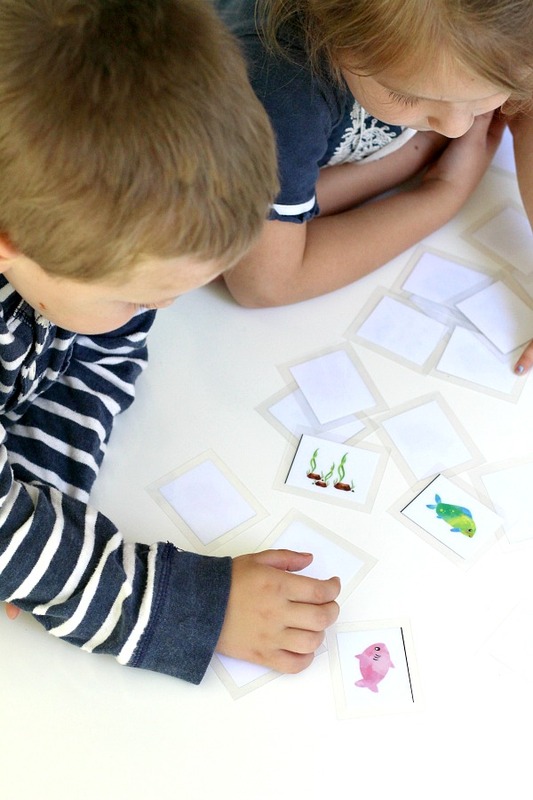 Have little ones simply play with the tiles and find matches without tiles being face down. Watching the game, even the older kids became interested. 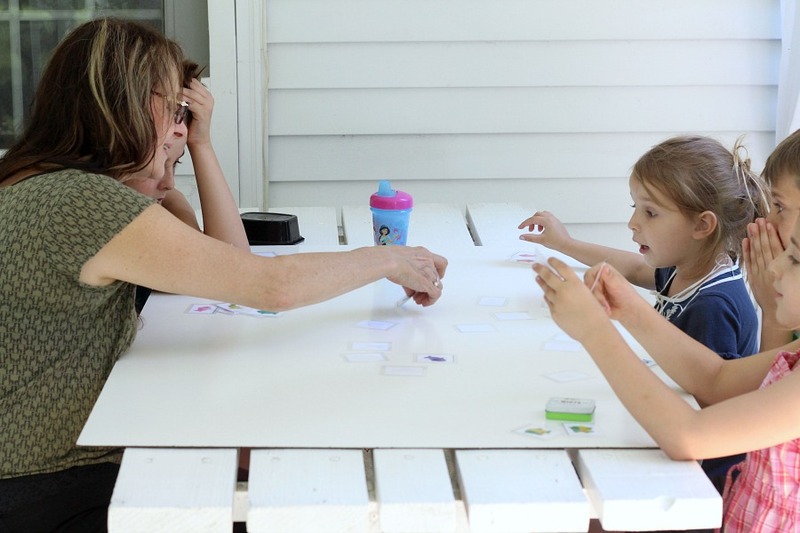 Game time is a great family time activity. 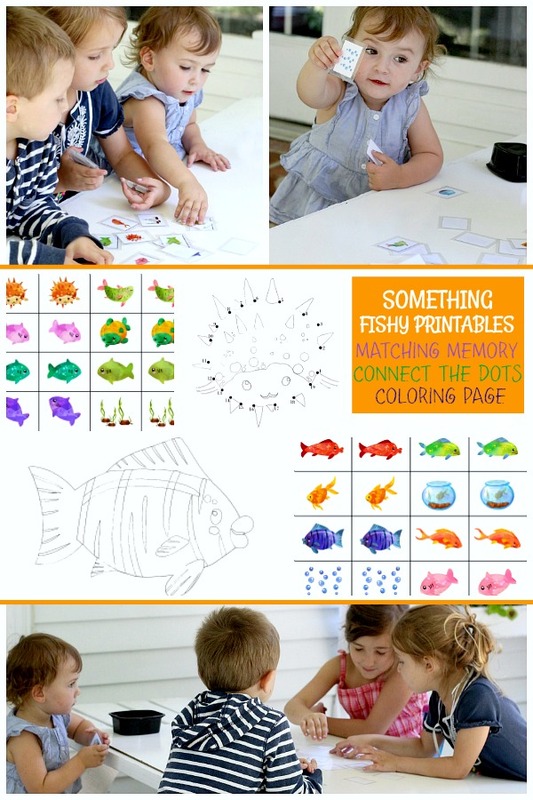 Fun memory challenge for all ages. An impromptu visit from our grandchildren was a sweet reason to take a break from pressure washing the driveway this hot Saturday morning! Download the pages (link below). 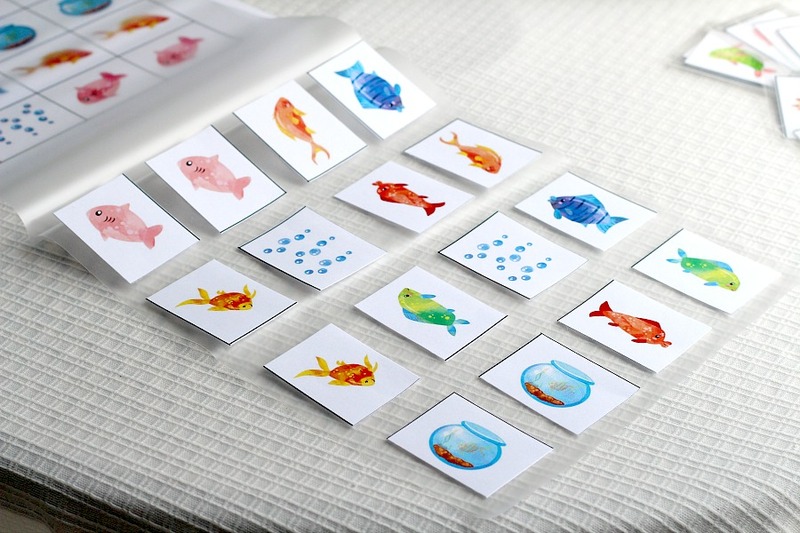 The matching tiles are best printed on card stock so the image does not show through. 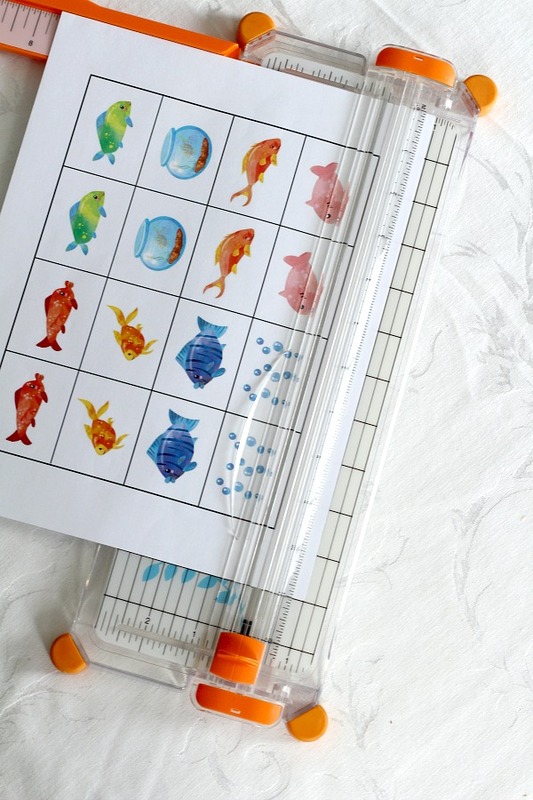 You don’t need to, but laminating the tiles make them durable and easier for little hands to play with. 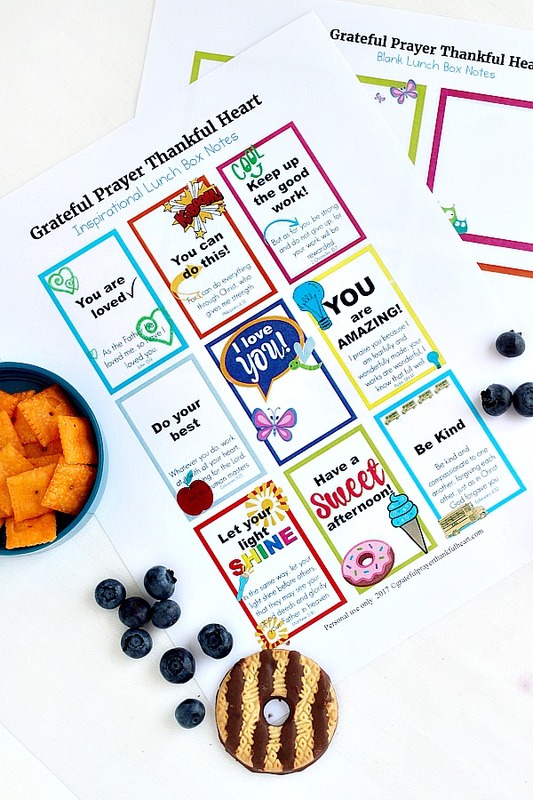 Print, cut them apart and laminate at home or head to your local business supply store to have them laminated. Using scissors or a paper trimmer, cut the laminated tiles apart leaving about 1/4-inch laminate border around the paper tile. Store the matching memory cards in a small ziplock bag or plastic container. 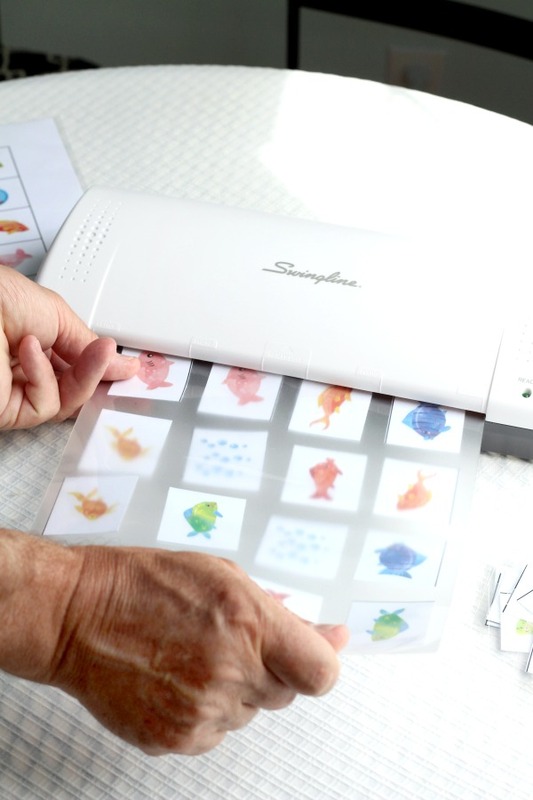 It never dawned on me that I could laminate items at home until recently. I just ordered an affordable laminator with a high rating. I was so excited to receive it and even happier that it works so well! 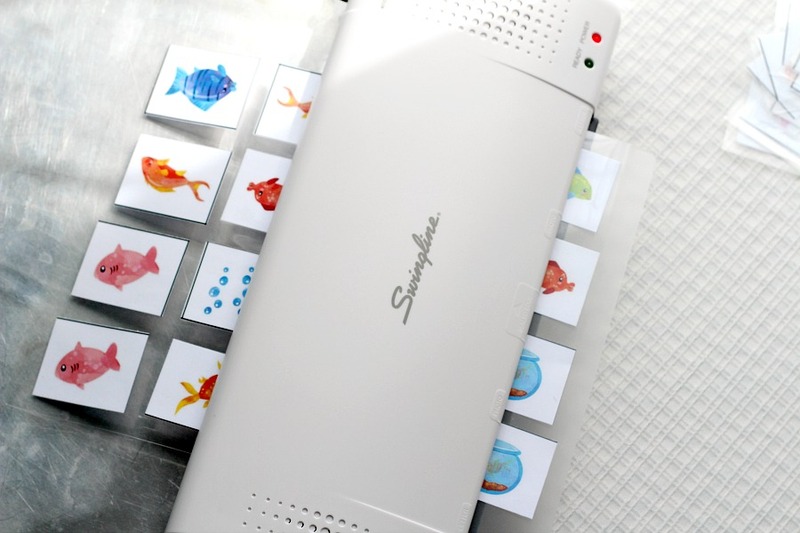 The laminator comes with a stater pack of pouches and you can also purchase additional thermal pouches. Using scissors or a paper trimmer, cut the tiles apart. Position the paper tiles on the laminating pouch leaving space between each; fold top layer of pouch over tiles. 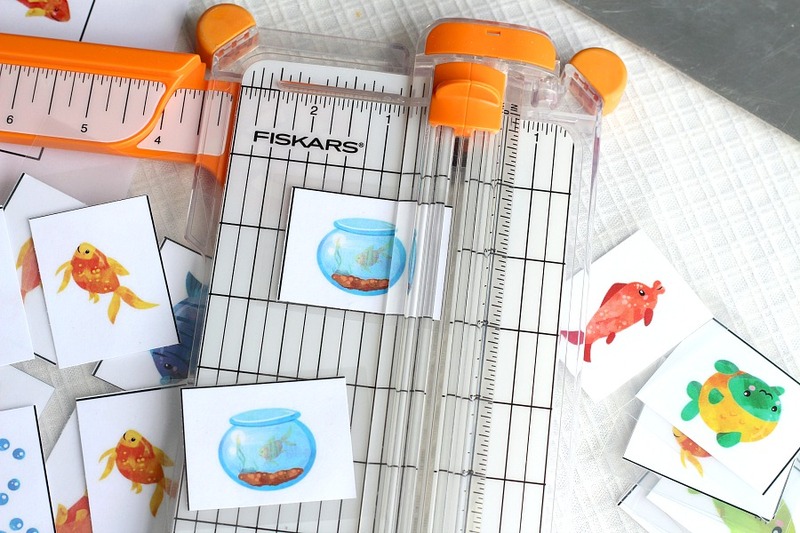 Insert the pouch into the laminator leading with the sealed edge. The laminated page will exit from the rear of the machine. Using scissors or a paper trimmer cut the tiles apart leaving about 1/4-inch laminate border around the paper tile. All ready to begin play! I have included additional pages for more summertime fun. 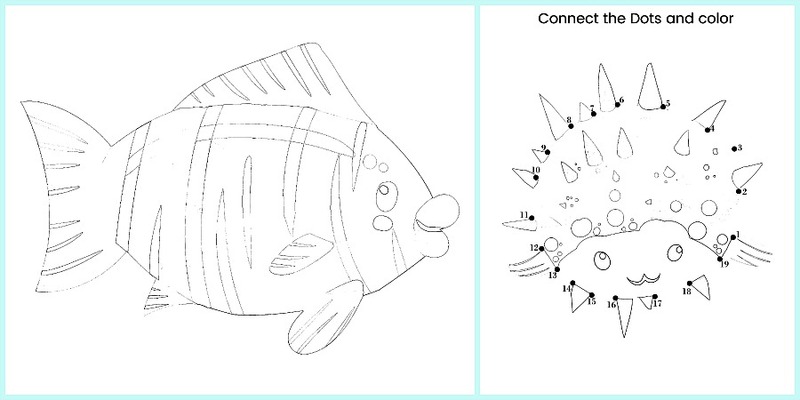 A fishy coloring page and a connect-the-dots page. What a fun game. I remember playing that kind of game with regular playing cards but the pictures make it more fun. WOW such a great idea, Lorraine, thanks for sharing. 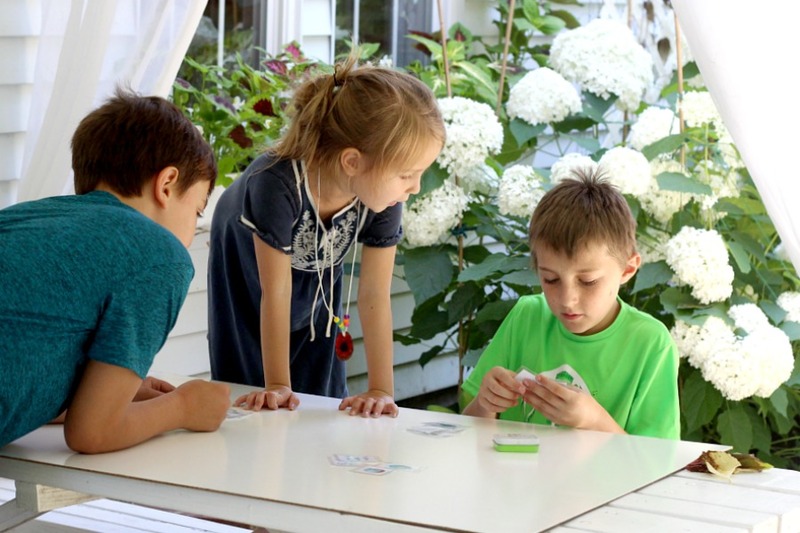 We always enjoyed playing games with our grandchildren when they came for the summer, we made such wonderful lasting memories just as you are doing.